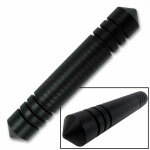 The Yawara Self Defense Tool was designed centuries ago as a method of defending yourself in Japan. The use of the Yawara is similar to a kubotan, in that you can use it to strengthen the fist during punching, wrist locks, striking, and poking pressure points. Constructed out of sturdy aluminum, this tool will be able to take a beating and keep you safe. Approximately 5" long and a diameter of 1"
"This is actually my favorite EDC item and it's severely underrated as a self defense tool. I've been obsessed with Yawaras since I discovered them three years ago and this model is my favorite. I even have custom made versions that cost 3 times as much and don't perform any better. In testing I've easily cracked coconuts, broken boards, and severely dented pots & pans with this Yawara. It also doubles as an emergency glass breaker too, so it's great to keep in the car. " "Very good product, it is compact and have some weight to it (making it perfect for weight loaded punches) also the the points on the sides are perfect for pressure point manipulation and for hammer fists or even frontal strikes with the other end. The body of the weapon is really solid. The weight is ideal to carry it in your pocket without creating a big bulge that could cause alarm. Like always check your local laws before carrying this item. Be advised mine didn't have no finger grooves like the one shown in the picture, but nevertheless a very good quality item. I will be buying another one." "very good weapon for self defense. it's very small and portable. I definitely recommend this weapon (tool)."